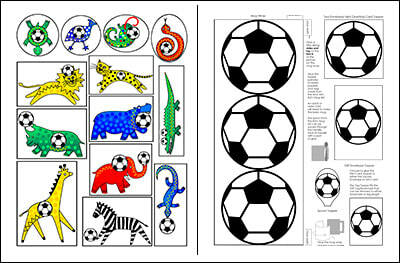 Colouring and Activity pages with an African Animal and Soccer Ball theme. These Soccer Safari friends are ready to play. Each is shown with a soccer ball. Just right for little boy and girl soccer fans! 13 Colouring Pages and 14 Activity Pages. Like spot the difference, dot to dot, maze and complete-the-drawing pages and more. Answers are on the last spread. There is some text in UK/ International English, but that does not detract from the activity fun for US readers. 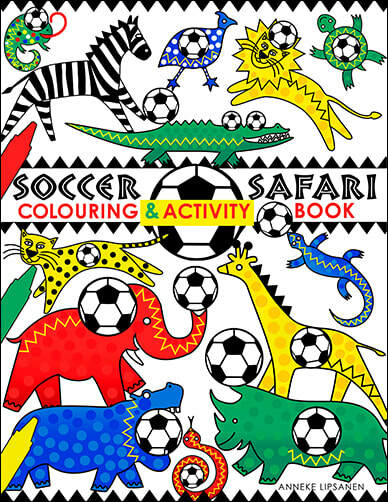 The bold line drawings of all the soccer animals are great for coloring in, fabric painting and paint crafts. 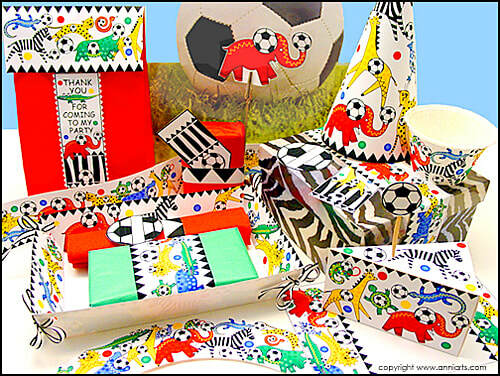 This theme also has coordinating animal and soccer ball party printables and gift products.